In hand pics of the cancelled G.I. Joe Mindbender, Budo, Zap, and Nano-BAT from Rise of Cobra! I think it’s safe to call Gyre-Viper the “Indiana Jones of the G.I. Joe fandom.” Venturing into the depths of the Chinese marketplace and scouring the internet for cancelled and rare items “that belong in a museum”, he manages to unearth more cancelled and prototype items than anyone out there. Some are good, some are bad but all are worth seeing. His latest batch of finds includes some figures that never saw production in the ill-fated G.I. Joe: The Rise of Cobra movie line. Consisting mostly of parts from previous releases, this set of four would have given fans an update on Budo, Dr. Mindbender, Zap, and introduced the Nano-BAT to fans’ collections. While Zap is pretty easy to recreate by performing a simple head-swap and the Nano-BAT is seeing a release though the G.I. Joe Collector’s Club Figure Subscription Service in the near future, I find myself sad when I realize that Budo and Mindbender won’t see a release in this form. Here are a few mirrored pics but check out the entire treasure trove of images over at JoeDeclassified.com! Rise of Cobra MARS Troopers — now $1 at HasbroToyShop.com! Looking for a Joe-based Cyber-Monday deal? How about a Thanksgiving weekend deal on some troop builders? Look no further than HasbroToyShop.com! Launched as the “preview figures” for the film G.I. 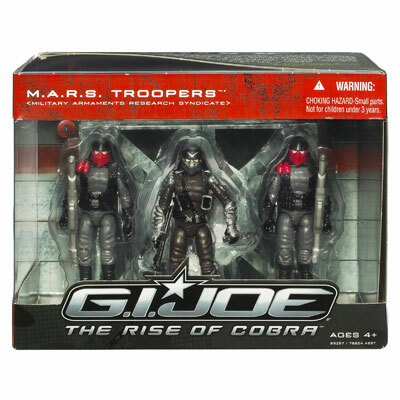 Joe: The Rise of Cobra, this MARS trooper three pack has been lingering at e-tailers and retail shelves ever since. The set includes two troopers and one officer as well as some RoC-themed weaponry. It’s not the most dynamic set in the history of Joe but it has one thing going for it right now– this set is only $1.00! That’s right– for $1.00 you’ll get three figures to use for generic troops or custom fodder! Heck, you can even purchase multiples and toss a few in a local Toys For Tots donation box! So, what are you waiting for? These figures aren’t going to get any cheaper!! Yeah, I’ll get to the Hazard Viper next! Just wanted to get this guy out of the way first! 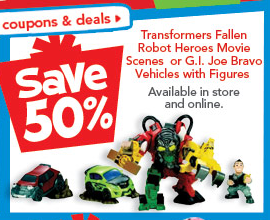 50% off Rise of Cobra Bravo vehicles at TRU today only! The special does NOT appear to include the newer Pursuit of Cobra vehicles. However, this might be a good time to snag some extra Joe schwag for Toys For Tots this year. 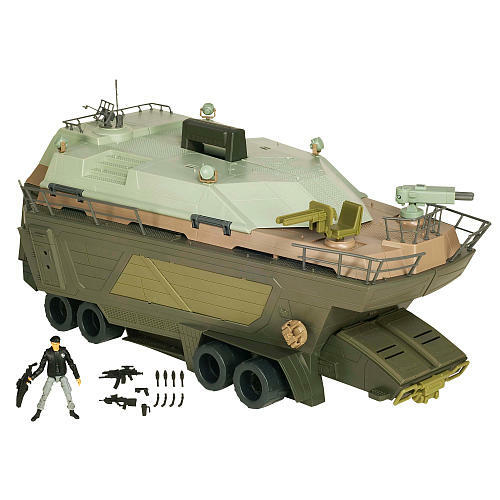 If you were on the fence about the Rise of Cobra movie Pit playset, this could be your best chance to pick one up. ToysRUs.com is currently listing the Pit Mobile Headquarters for a whopping $19.98— marked down from the MSRP of $99.99. Reviews of the set were mixed upon its release. Some fans praised it as an innovative play and display environment. Others compared it to a giant land boat. Regardless, $20.00 + shipping nets fans an exclusive Dennis Quaid General Hawk figure, a coffee mug, and a card board ping pong table at the bare minimum. Shipping seems to be estimated at $10.42 by default which means that for $30.40, the Pit could be yours. Talk about its release HERE. Sunday November 1st: Daylight Savings Time ends, so remember to set your clocks back one hour before you go to bed Saturday night. It’s also a good time to change out the batteries in your smoke alarms. Sunday is the deadline to have your questions submitted for the next round of “Ask Hasbro”. Sunday is also the day the TRU Toy Book comes out with some Joe goodness on sale. Monday will be the submission day for the above mentioned questions. Tueday—now what is it that is supposed to happen on Tuesday……………? Oh wait isn’t there supposed to be some new DVDs coming out that day like maybe Resolute and Rise of Cobra?